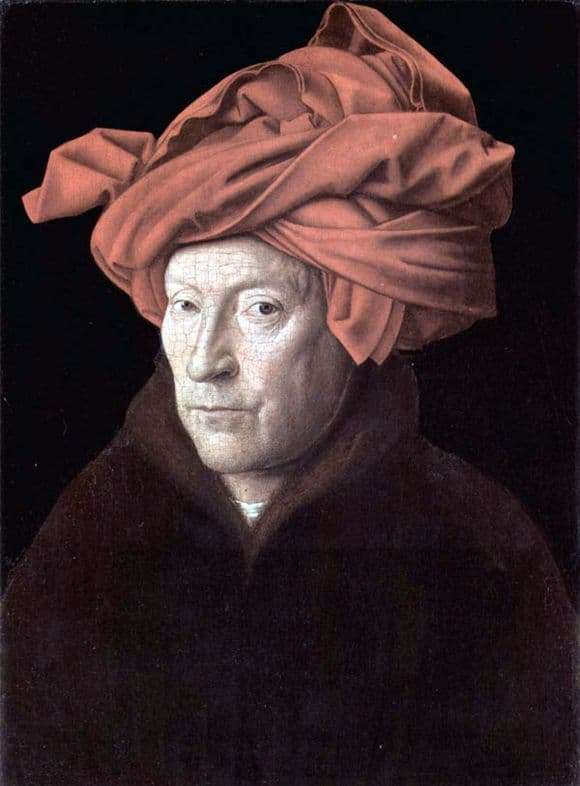 Recent studies of the work of Jan van Eyck insist that his work in 1433 is a self-portrait. To make such a conclusion is not so difficult. It’s all about the existence of distinctive features of self portraits. Looking at this picture, we can assume that the person depicted on it looks at its mirror image. After all, so usually created personal portraits. In addition, on the original frame of the picture were the author’s inscriptions. One of them is translated from the Flemish language as I can; historians see the motto of the Flemish painter in the phrase (the artist paints as he can). These words are on three works of the master, who lived to the present. The indicated words are stamped on top of the frame, and the inscription on the bottom is longer, where Jan affirms his authorship and indicates the date – October 21 of a certain year. “A man in a turban” is another name for a mysterious canvas. In fact, it is somewhat erroneous. In the Middle Ages, men often wore a headdress with a different name – a chaperone. The improvised “hat” was something similar to a modern hood. But the fabric on the depicted head of a man is folded so skillfully and complexly that it resembles the turbans or turbans that are common in the present Eastern countries. The longer you look at the portrait, the more surprising it becomes. The color palette is not diverse: brown clothes without any details and a red headdress, the background is black. The face of the painter is a healthy flesh-colored, light blush is noticeable. Eyes – thoughtful, focused. The painting is painted in oil on wood. Oil paints in those years only appeared and gradually improved. Eik was fortunate enough to appreciate the merits of a great coloring material. “Self-portrait” now flaunts in the National Gallery of Foggy London.